Do you have a looot of family and friends and you’d love to be able to gift them all something this Christmas? Something they would actually love receiving? Are you searching for Christmas gifts that will fit into your budget and that are not boring socks? Then these DIY Christmas gift boxes are the answer! They are super easy and fun to make and will save you a lot of money. And no, you don’t need super craft skills to make these Christmas gifts! This year my husband and I have started a family tradition for Christmas gifting, where we need to keep an average budget of 15 Euros per person. And this means we can, for example, get a 20 Euros gift for his dad, and a 10 euro gift for our neighbor. These DIY ideas are fast and I have made many in “bulk,” so I will have gifts for so many people on my list this year. Some of the elements are really just cheap, symbolic stuff that I bought directly from the booming Christmas gift and sweets offer now. I find handmade Christmas gifts to be much more thoughtful and sweet. The fun part is that as your kids grow, you can turn this into a family tradition and do this together, by preparing a small Chrismas workshop. Honestly, I just can’t wait to do this with the girls! And in the end, for me, it’s really the thought that counts and not the price of the gift. So if you too need many Christmas gifts, this is a good starting list that will pretty much fit anyone, as they are extremely flexible. First of all, what I personally did was prepare 3 DIY super easy cosmetical products as a base gift for the girls. I have created my own labels for this in Photoshop and added the ingredients and instructions on them. Here is a detailed tutorial on how you can make your own Lavander Bath Salts. Keep in mind that you can totally modify this according to what you or the person who will receive the gift likes. I have purchased on Amazon a set of Kraft Paper Labels similar to these ones and printed my design on them. I have used the large sizes for all my jars, that is the la 3.5 by 2 inches (51 cm by 89 cm). The jar in the picture is an 800 g (1.7 lbs) jar. The approximate cost for 1 similar jar of Lavender Bath Salts is about 4.5 Euros. Here is an idea from The Cottage Market on how to make your own strawberry sugar scrub. I ended up tasting some of the final product and it was suuper delicious. I use the flavor drops because they also smell amazing and this really changes the whole product. I don’t know an equivalent in the U.S., but I purchased my Wild Strawberry drops from Amazon Germany. You can also use the exact same sugar scrub and package it in small containers and use as a lip scrub. For this body scrub, I used a smaller jar, of about 500 g (1.1 lbs) which I purchased for 1.19 Euros at a local chain in my city. I estimate the Strawberry Sugar Scrub to cost about 3.5 Euros per jar. This will make you quite a big batch, so if you need less, I suggest you use only half of the quantities I used above. I made many of these and packed them into the cute paper bags above. I attached these to a box of candy and will use them as an individual small gift, as it is less than 4 Euros in total. As for the container size, I actually order an assorted cosmetic container batch and I found that the 5ml ones were too small, while the 20 ml were too big, so I went with the 10 ml ones. An approximate price for 1 container of Lip Balm is 2.5 Euros. And now, for the boxes. I have bought from the 1 Euro shop in my city a bunch of Christmas item to use on the wrapping and decorations. But here is where you can get super creative and really just play around with all the Christmas deco possibilities you find in your own area. I got a full bag of dried lemons, 1 bag of dried apples, 1 bag of cinnamon sticks, 1 bag of pine cones, 2 bags of candy canes, 2 roll sets of red and white thread, 2 big craft wrapping paper, plus various sets of Christmas decoration items like sleighs, red bells, stars and angels. I also purchased a few tiny scented oil bottles for the oil diffuser that smell like Christmas Cookies, each for 1 euro a piece. For the sweets I a chose Belgian Chocolates, Chocolate Cookies, Traditional German Mini Butter cakes and Marzipan Chocolates, each for an average of under 1 Euro a piece. The Rum Liquor Bottle was 6 Euros, so the final approximate price of box number 1 is about 11 to 12 Euros. I got the double CD for 9 Euros and I am super happy with the music selection on it, it really has only Christmas Hits. I actually think I’m going to order one for my family as well. Approximate price of box number 2 is about 13 Euros. This box was super affordable, it ended up at an approximate price of 6 Euros. I have prepared this last box for the girls: my mom, aunt, cousin and girlfriends will each receive one, and each with its different decoration. The price for Box Number 4 is approximately 16 Euros. It is seriously so much fun to prepare these and people really appreciate receiving something different. 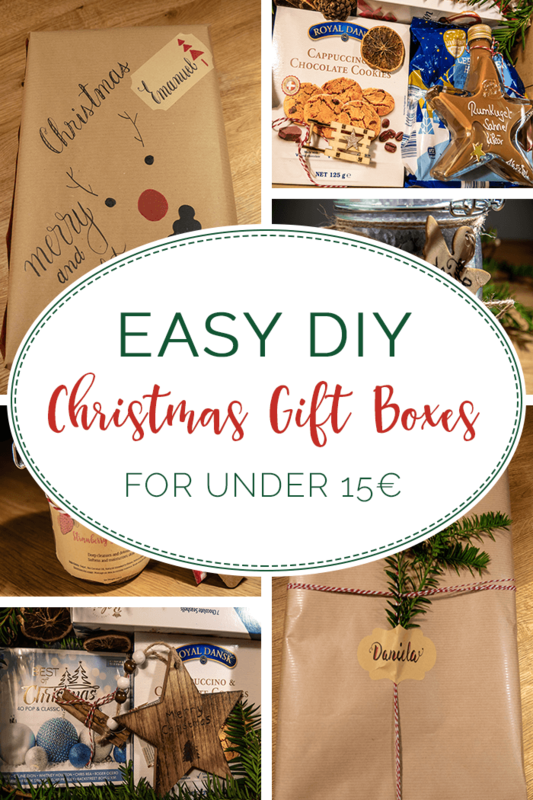 Here is also a selection of 21 Easy DIY Christmas Gift ideas under 15 Euros, ready for everyone on your list, fun and easy to prepare. I plan to try and make some of these next time. So what are your favorite easy, cheap DIY Christmas gift ideas?